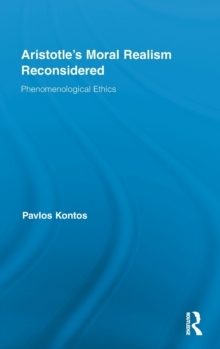 This book elaborates a moral realism of phenomenological inspiration by introducing the idea that moral experience, primordially, constitutes a perceptual grasp of actions and of their solid traces in the world. The main thesis is that, before any reference to values or to criteria about good and evil-that is, before any reference to specific ethical outlooks-one should explain the very materiality of what necessarily constitutes the `moral world'. These claims are substantiated by means of a text- centered interpretation of Aristotle's Nicomachean Ethics in dialogue with contemporary moral realism. The book concludes with a critique of Heidegger's, Gadamer's and Arendt's approaches to Aristotle's ethics.